Beautifully maintained 2 bedroom 2 bathroom bungalow villa with private pool. 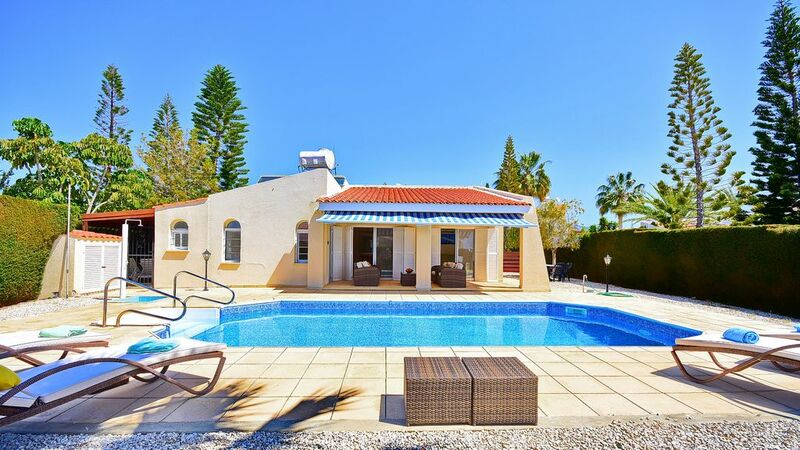 Beautifully maintained 2 bedroom 2 bathroom bungalow villa with private pool in Coral Bay ideally located within a short walk of the main strip and the sandy beach. Two spacious bedrooms, one master double with en-suite shower room and one twin with air conditioning throughout. The villa is very well furnished and equipped and includes air conditioning throughout wi fi, private 4m X 9m pool with walk-in steps, built barbecue, pool/beach towels, UK TV channels, shaded outdoor lounge area overlooking the pool, and a full collection of outdoor furniture. The villa will appeal to first time visitors to Coral Bay as it is centrally located within a short walk of the center. It also offers privacy and seclusion. One bathroom is an en-suite with shower and toilet whilst the second is a full sized bathroom with bathtub and shower head. air conditioning is available in the lounge and dining areas as well as the bathrooms. Heating is available via split unit as units. Secure gated off-street parking for up to 2 cars is provided. Wi fi is available throughout the villa grounds. Pool/beach towels as well as bath towels are provided for. Air condiitoned lounge area with access to the shaded outdoor pool area and shaded outdoor lounge area. Separate fitted kitchen with all the expected utilities including dishwasher. Shaded outdoor lounge area overlooking the pool. Completely private 5m X 9.5m pool with walk-in steps. Villa was lovely,so peaceful and quiet,only about 10 minute walk to strip, pool was a decent size for 4 of us, would definitely return without a doubt. Chris's directions need updating a little, would not have liked trying to find my way around in the dark, luckily a day time flight! Have tried many Villas in Coral bay area but this is out favourite - far enough away from the strip but walkable in 15 mins. ( 1.5 euro on bus, 2.5euro after 2100hrs). When we return to Cyprus this is the first Villa we will see if available. This is the fourth villa we have rented in Coral Bay and it is by far the best. Excellent service from the property manager when we needed a plumber to fix a leak! The only downside is the pillows, could do with replacing. Other than that we had a fantastic time, thanks Chris. Gorgeous place. Well equipped villa quiet location. Quiet area, within walking distance to entertainment and beaches! Please note that the rental rates quoted are net and there are no added or otherwise associated costs to the villa hire of any nature. The rental rates are also inclusive of the use of air conditioning and high speed wi fi. If you would like to book the villa, the first step is for us to put a hold on the property for you for up to three days in order to allow for you some time to search for suitable flights. We can do this for you if you send us a return e mail request and there is no obligation on your part. Once you have secured flights we then ask for a down payment of 25%. This can be paid via credit/debit card, via Pay Pal, or by bank transfer. The balance would then be due 8 weeks prior to arrival. Once the balance has been paid we will send you a small form to complete with your arrival details, flight numbers, times, number of persons etc and we can either arrange for a taxi to meet you at the airport and drive you to the villa or if you hire a car through our own recommendation then the company would deliver the car to you there. If you would like to make your own arrangements to get form the airport to the villa then we will send you directions and the key code so that you can gain access.